Let’s face it, we all have places that we call favorites, and Land Between the Lakes’, The Homeplace 1850 is without question one of mine. It’s hard to explain the allure, but it can’t be denied. Every single time I travel that way I find myself making a special effort to visit The Homeplace. To see it you’ll have to travel about 12 miles south of the Golden Pond Visitor Center on The Trace, all the way into Stewart County, Tennessee. 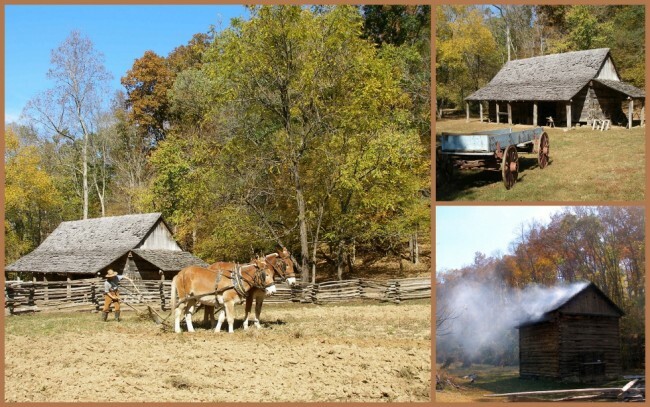 The Homeplace sits in Pryor Hollow and is home to 16 log structures, 14 of which were original and moved to the site from within 10 miles of the area. In addition to the log buildings, their Visitor Center is one of the best around, with a high-quality AV presentation, diverse and wonderful gift shop and a top-notch staff waiting to make your visit memorable. The real fun begins when you leave the VC and take the scenic walk into the main compound. 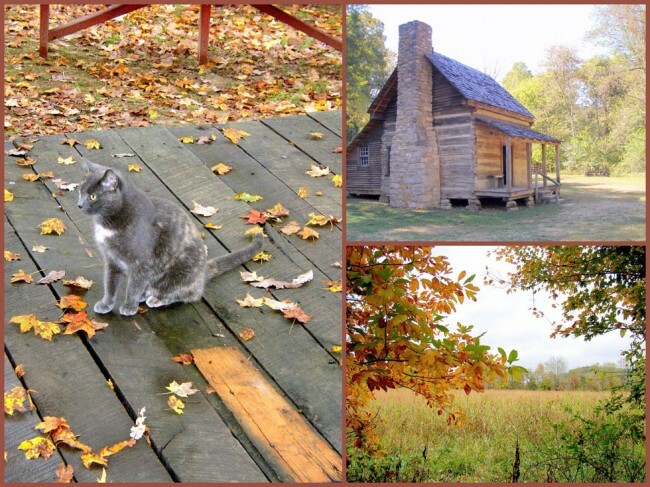 The first thing you’ll see is a massive, two-story double-pen log home with breezeway (sometimes called a dog trot), usually decorated with mattresses, quilts, pillows or possibly seasonal agricultural fare (pumpkins, gourds, corn ears, etc.). Like in the “old days” these may be on the porch or possibly airing out on the split shingle roof, all giving a very “lived in” feel to the place. 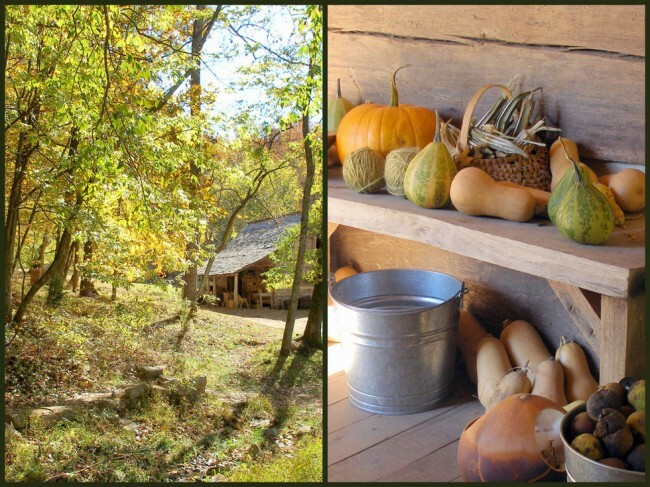 On most of my visits to The Homeplace the air was filled with the smell of wood smoke, sometimes mingled in with the aroma of delicious foods being cooked in the traditional pioneer era kitchens. 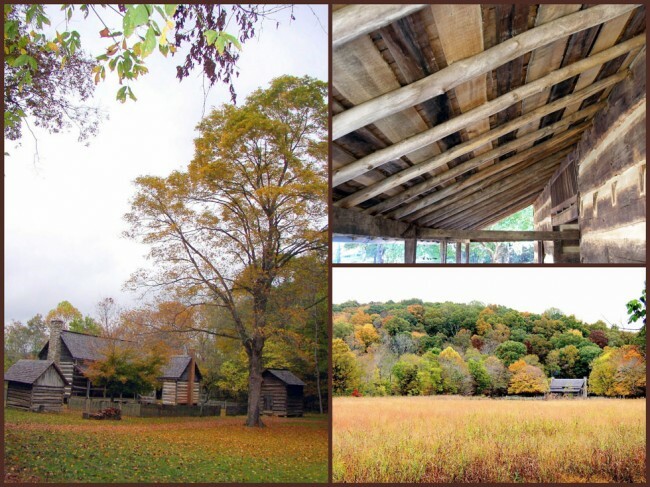 As you enjoy this self-guided experience you’ll also pass by numerous other interesting places: a single-pen house, tobacco barn, spring house, various stock (farm animals) pens & barns, a smokehouse and much more. One annual treat for me has been to visit with their resident cat Smoky, who in 2015 as still alive at the very old age of 14 years. 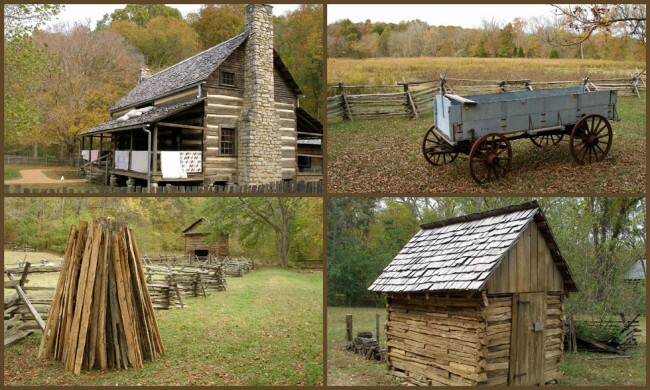 One of my favorites buildings is the tool barn where there’s often a demonstration going on showing “old school” carpentry techniques to anyone wanting to see how it was done in the early days of settling the American wilderness. I’ve always learned new & interesting techniques which I’ve actually applied in some of my woodworking projects. You’d be amazed what you can do with a draw knife and spoke shave. This year for example I learned how to make various wood stains from common items found in nature. Their on-site craftsman is a wonder to behold; working in all areas from blacksmithing to furniture making, to tending the gardens and fields to “old school” tobacco curing techniques. For me at least this is a “must see” on every visit to The Homeplace. One great thing about this place is that they’ve always got something new and exciting to check out. On a recent trip there, for the very first time we (my son Keith and I) saw them plowing a field with their team of mules. Another first was the fact that they were actually smoking their tobacco and curing it, just like they did over 150 years ago. Here and there we saw new farm implements and materials getting ready for use. 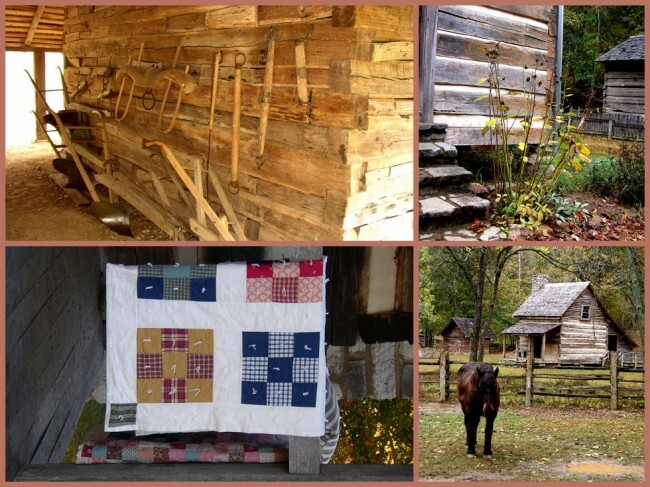 The Homeplace is open from March 1st through November 30th. Their hours of operation vary somewhat from season to season so you’ll need to check their website at http://www.lbl.org/HPGate.html or call them at 270-924-2020. 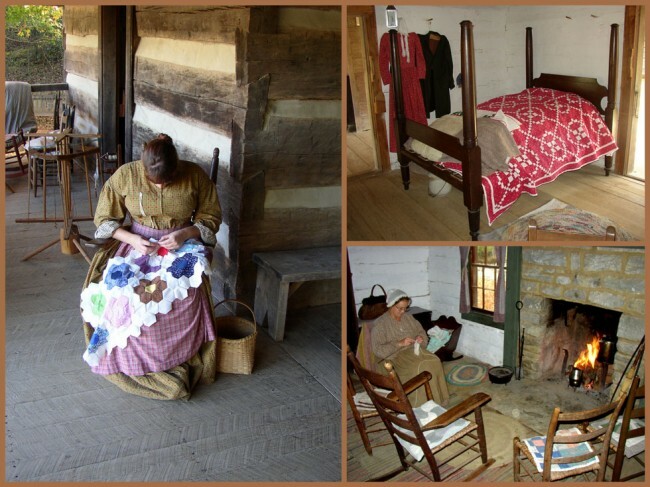 If you’re ever in the Dover,Tennessee area or visiting The Land Between the Lakes, make sure to take time to explore The Homeplace 1850, you’ll be glad you did, it’s a truly great experience. Last modified on: November 4th 2015.